CSC is a complete Theatrical/Live Sound Show Control Software package for Windows XP/Vista/7/8/10. It can be used to tie together all aspects of live sound control, and enable performances far more complex than could ever be dreamed of using traditional human control. Shows can be designed using cuelist methodology, for sequential events to be triggered, or for one-off, less predictable events, pages of hot scenes to instantly recall any state or sound can be pre-programmed. MIDI control is supported in the form of standard MIDI messages, MIDI Show Control, MIDI Machine Control and customizable strings of System Exclusive commands. 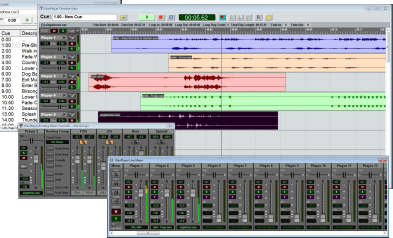 MIDI Sequences can be recorded to enable capture of modern digital mixing desk's fader movements, or for live recording of sound effects sequences using samplers and keyboards. Audio playback can be automated, with an offering of 32 playback devices, each of which can be programmed to Play, Stop, Fade, Pause or Resume standard WAV files, to any suitable output devices installed on the system. Complex sequences of wave files can be mixed and layered easily using the Live Mixer module, which can control the level and pan of any of the playback devices at any point in time, as well as traditional mixer features such as Solo and Mute to fine tune and diagnose problems in a mix. Equipment designed to respond to RS232 Serial commands such as DVD players or video mixers can be controlled from CSC also, the Serial module allowing user defined messages of ASCII or HEX characters to be sent to up to 4 Comm ports on the computer. Events can be triggered by remote control button boxes, MIDI commands, TCP/IP network messages, and triggers can even be based on the system time clock. Multiple computers can be networked together to track a master and send network chat messages to each other. The External trigger list allows 4 additional cuelists to be constructed allowing event triggers such as switches in props or MD click track start buttons to be integrated into the system with ease. All events are safeguarded to occur at the correct time only through the use of cue regions. New to Version 3 is the inclusion of a wave display editor to finely adjust wavefile start and stop points without needing to jump out to an editor, add loop points to enable easy vamping and constantly changing soundscapes, and well as a timeline based editor similar to traditional sequencers to visually edit a cue (From version 3.1). "Image" groups can be set using the new Routing Mixer and recalled or edited on the fly. CSC has been designed by people who really know the industry, and as such offers a set of features you really need, in an all round easy to use package.